We have seen the way Professor James McGrath boldly wrote that Doherty said or did not say certain things in his “review” of his book and the way I could demonstrate word for word, page for page, that McGrath clearly had not read as much of Doherty’s book as he claimed he had. Then we saw Bart Ehrman making so many gaffes in his self-proclaimed first-ever scholarly “sustained argument that Jesus must have lived”: among the very many howlers were attributing to G. A. Wells an argument he flatly opposes (that Jesus was crucified in the heavenly realm my demons) and attributing to Doherty as “one of the arguments he makes in his book” the actual central thesis of his book! Next appeared an anti-mythicist book by Maurice Casey that erroneously accused several non-mythicists of being his hated targets and that again accused others of sustaining arguments they in fact do not hold. Most recently I have experienced James Crossley ignoring titles, sub-headings and opening words of my sentences in order to lift part sentences out of context to sarcastically accuse me of writing the very opposite of the point I was making. Why do scholars, professors, seem to be incapable of reading with minimal comprehension certain types of works they seek to refute or that they presumably merely fear they might find offensive? Is there a certain measure of fear there? Fear that others might see that their research careers have been built on sand? Or is it just plain old intellectual arrogance? For whatever reason it seems to me that such scholars approach certain types of works so emotively that they are incapable of reading the words on the page with any normal faculty of calm comprehension. Sometimes I’ve opened a letter or email I’ve expected to be outrageous in some manner and I’ve read it with that presumption and reacted just as I expected to react after glancing over it. Only later after calming down have I been able to see that I read my initial expectations into the words and that it was not nearly so bad as I had originally thought. Is that how scholars read works by mythicists (or even from me in some cases?) — except that they never return later for the second reading in a calmer frame of mind? Earlier this month Candida Moss (noted recently for her Myth of Persecution) and Joel Baden (The Historical David), both reputable professors, combined to produce a bit of sarcastic “comedy” for The Daily Beast, — ostensibly a review of a crazy mythicist publication. James McGrath couldn’t resist a good guffaw and immediately invited all of his readers to take a look and get a good belly laugh, too. Aren’t those mythicists such incompetent ignoramuses! That was the message and presumably the entire intent of posting the review and notice of it. Maybe I’ve been around this business for too long now but I sensed something was not quite right. None of these professors actually explained what the book was about but only mocked a particular claim giving us all the distinct impression (but without actually explicitly saying so!) that this risible point was the central thesis of the book. So I bought a copy of the book to read for myself. The article I’m referring to was in the Real Deal section and given the title So-Called ‘Biblical Scholar’ Says Jesus A Made-Up Myth. In the article Moss and Baden (and subsequently the others) mock a list of 126 ancient names apparently presented as authors from whom we “should” have some evidence about Jesus had he existed. The book being targeted was No Meek Messiah by Michael Paulkovich. 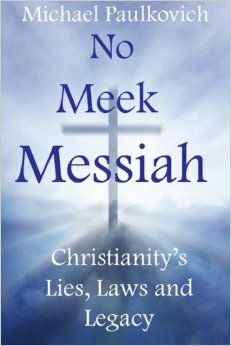 Did anyone who wrote about No Meek Messiah ever read it?